Oddfellows generally, for the term encompasses several different groupings, claim to be among the oldest fraternal and benevolent societies. 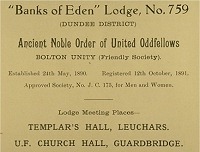 Oddfellows were among the first friendly societies to begin to bring independent lodges into affiliation and to create networks of lodges answering to a Grand Lodge. Evidence for fraternal societies calling themselves 'Oddfellows' is claimed in England from the middle of the eighteenth century. Their histories adopt universally much earlier origins, linking themselves by means of supposed offshoots of medieval trades guilds to the Roman occupation of Britain and from Roman mutual support clubs to the Israelites in Babylon! Other traditions and 'facts' have become part of Oddfellow lore; they are mostly unsubstantiated by evidence. Such extended histories are a common feature of affiliated orders. One reason for them was a desire to show 'permanence' - a long established mutual club might be a more attractive proposition than an organisation with no track record. Another was that the origin myth fostered an emotional link between a grand lodge, hundreds of local lodges and the thousands (later millions) of individual members - each generation could view themselves as the current embodiment of a great tradition. Both reasons acted to sustain membership in a sector that throughout the nineteenth century increased in both complexity, as new affiliated orders were created, and numbers, as more people were able to afford subscriptions. In reality, the main reason the Oddfellows flourished was because their benefits and the financial stability of the organisation were more attractive than many of their rivals. For example, travel warrants allowed free accommodation overnight in the premises of distant lodges, which was a boon to those searching for work. Through what was surely good fortune at first, their actuarial calculations were better than comparable societies establishing a form of positive feedback that encouraged expansion. Much of the growth was led by the Independent Order of Oddfellows (Manchester Unity) Friendly Society. This body was founded in 1810 (although recorded minutes do not begin until 1814). The headquarters of the organisation was Manchester; the main base of the Bolton Unity was that town. Lodges of the Manchester Unity opened in East Lothian and Edinburgh in the 1840s, when Lodge Loyal Tyneside in Haddington, Lodge Loyal Hope in Dunbar and Heart of Midlothian in Edinburgh are all recorded. By 1875 the Oddfellows had acquired premises in Forrest Road, Edinburgh, for a meeting hall and offices. However, its first occupants appear to have been the Scottish Order of Oddfellows. The origins of this order are unknown, but within 10 years they shared their premises with the Edinburgh District Headquarters of the Manchester Unity, so relations between the Orders must have been fraternal. By 1900 a third Oddfellows organisation operated from Forrest Road, the National Independent Order of Oddfellows; a fourth, the Caledonian Order of United Oddfellows, had premises in Hope Street. Find out more about Oddfellows Orders. A considered view of Oddfellowship by. Dr Bob James. His analysis cuts through the smoke of mythology to show that the real origins of Oddfellows are still obscure and that the work of discovery remains to be done.